Eggs are one of my favorite foods. They are delicious and versatile and packed full of nutrients, healthy fats and protein. They are pretty darn close to a perfect food. The best option is to eat pastured eggs — meaning eggs that come from chickens that are raised on open pasture and regularly eat grass, plants, bugs, grubs and whatever else they can find in the fields. Chickens are omnivores and the quality, taste (and health benefits) of their eggs is largely dependent on what they eat. 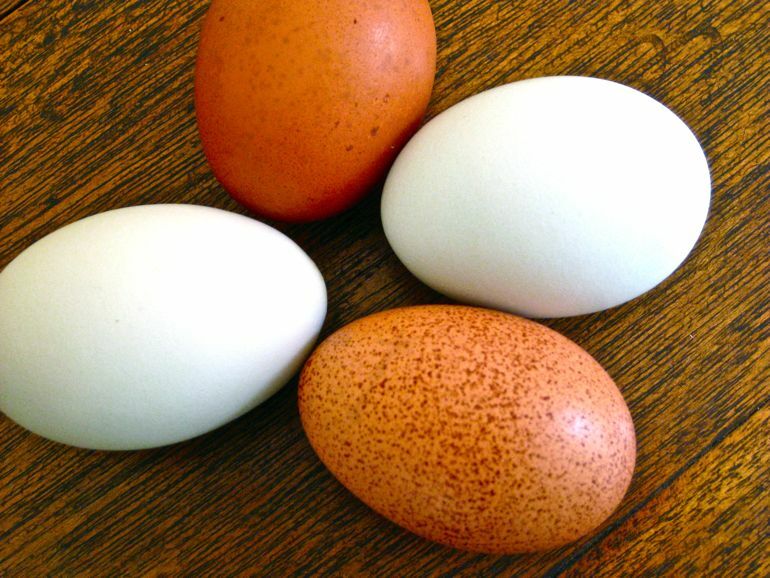 Where do you get these beautiful pastured eggs? If you have access to a farmers market you should easily be able to find them there, just make sure to ask the farmer if his or her eggs are pastured. If you don’t have access to a farmers market check out these sites for local sources: eatwild.com or localharvest.org. I came up with the following recipe last week after buying pastured eggs at the Berkeley Farmers Market. I wanted a hearty yet healthy meal that highlighted the delicious eggs and incorporated some of the veggies I got at the market as well. This recipe could have infinite variations. I added the vegetables I had on hand, though for a more authentic fried rice you could add peas. The greens are not traditional either but I like to incorporate a leafy green into a dish when I can and it works very well here. I used Swiss chard though any leafy green would work, spinach and kale come to mind. This is an easy and delicious dish. I think kids would eat it too, though that hasn’t been tested. Melt butter in medium saucepan and add green onions, sauté until fragrant and tender. Add rice and stir for about 5 minutes to lightly toast the rice. Add the liquid and bring to a boil, cook uncovered for about 10 minutes. Turn heat to low and cover and cook until all the liquid is absorbed about 30 to 45 minutes. Remove from heat. When the rice is almost finished, add oil to sauté pan heat slightly and add onion, cook until tender on medium heat. Add carrots, stirring frequently until tender and mostly cooked through. Add the Swiss chard, water and tamari, turn heat to low and cover, cook until greens are tender. Scoop this mixture (draining excess moisture) and add to the rice. In the same pan, after draining the excess liquid, melt butter and crack four eggs into the pan. Smash the yolks with a fork and gently mix and flip eggs until cooked through. Add eggs to the rice and vegetable mixture toss gently and serve. Add tamari sauce to taste.